This is a page about MASUMURA Hiroshi Exhibition Featuring the Works of Hokusai ATAGOAL x HOKUSAI for the Sumida Hokusai Museum. Manga artist Hiroshi Masumura's 'ATAGAOL x Hokusai' series depicts a utopian world where cats and humans live as equals. That purry ideal meets ukiyo-e master Katsushika Hokusai's iconic works. Moreover Hokusai’s work which give inspiration for Masumira. MASUMURA Hiroshi is Japanese Manga artist. He has long developed his own fantasy world through his comic series Atagoal. In the comics, the trouble caused by Hideyoshi leads to new discoveries being shared with the world. The joy of these illustrations came from seeing Atagoal characters like Hideyoshi integrated into the spectacular scenes drawn by Hokusai, and yet these are no mere parodies of Hokusai's works produced by simply replacing the people in them with Atagoal characters. Rather, MASUMURA has provided commentary for each one of these illustrations, explaining the thoughts and processes involved in incorporating Atagoal elements, as well as his opinions and commentary on the original works by Hokusai, including his respect and awe from working so closely with these prints. As a result, this exhibition comprises both art and commentary, making it, in a sense, a research project on Hokusai's work. We invite you to compare MASUMURA's contemporary works with the original ukiyo-e prints by Hokusai (old woodblock prints, display panels, etc. 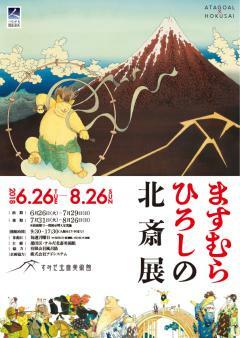 ), to discover their differences and better enjoy MASUMURA's interpretations of Hokusai's work. Naturally, the portrayals of the main characters from Atagoal are among the highlights of these pictures. The addition of MASUMURA's sense of humor and interpretations of these works makes for a whole new way to enjoy the world of Hokusai. Note: Some of the Hokusai ukiyo-e prints on display for comparison are from our collection. 24 art pieces (print: 9, wood block-printed book: 15) produced in the Edo era will be split between the first and second halves of the exhibition period. The others are reproduction woodblock prints produced by Adachi Woodcut Prints, in cooperation with the Adachi Foundation. The comic series Atagoal is the best known of artist MASUMURA Hiroshi's works. To date, there have been four Atagoal series: Atagoal Monogatari, Atagoal Tamatebako, Atagoal, and Atagoal wa Neko no Mori, all with a main focus on fairly short, self-contained stories. These stories take place in a world called Atagoal, and star a cast of distinctive characters like Hideyoshi, a humorous cat who walks upright on two legs. One hallmark of the series is the way that trouble caused by Hideyoshi leads to new discoveries being shared with the world. The name “Atagoal,” incidentally, was based on Atago Station on the Tobu Urban Park Line, a train station in MASUMURA's hometown of Noda City, Chiba. Born in 1952 in Yonezawa City, Yamagata. He began drawing comics at the age of 20, and made his debut in 1973 with Kiri ni Musebu Yoru, which won second prize at the 5th Tezuka Awards. The same year, his comic 1975 won a prize from the monthly magazine Garo, and in 1975 his comic Yonezādo Monogatari ran in the same magazine. Starting in 1976, the original Atagoal Monogatari began running in the monthly Manga Shōnen. The world of Atagoal was heavily influenced by Ihatov, an imaginary world created by MIYAZAWA Kenji. The stories of the many distinctive characters, such as the humorous cat Hideyoshi, proved very popular. Over a long period of time afterward, the stories of Atagoal came to span multiple series. The characters have starred in many commercials for major brands, and in 1997, Atagoal Tamatebako won the Japan Cartoonists Association Grand Award. Since 2006, MASUMURA has also worked as an Oshoshina Tourism Ambassador for his hometown of Yonezawa City. In addition, in Yonezawa City, there is the Yonezādo-gō loop bus, which features pictures of Atagoal characters. In 1983, MASUMURA began to produce adaptations of many of the works by MIYAZAWA Kenji that had had such a strong influence on him. In 1985, the animated movie Night on the Galactic Railroad, based on MASUMURA's adaptation of the original novel, was released, and in 2001, he was awarded the Ihatov Award by the Miyazawa Kenji Association. His more recent adaptations of MIYAZAWA Kenji's work include comics based on Yamanashi, Kenjū Kōenrin, Otsuberu to Zō, and The Shining Feet. *Group admission applies to 20 and more paying adults. *Junior high, high school, and university students (including technical college, vocational school, and special training college students) will be requested to show student ID. *Adults 65 and over will be requested to show a document verifying age. *Persons with a certificate such as the following plus one accompanying person are admitted free of charge: physical disability, intellectual disability, rehabilitation, mentally handicapped health and welfare, atomic bomb victim health notebook, etc. *Use of these tickets is limited to the day on which the exhibition is visited, and allow you for entrance to AURORA (Permanent exhibition room), too.